After food begins to be served, Tiana comes up on stage (in her beautiful white gown!) and introduces the musical performers The Crawfish Crooners! The music is so fun, and you can’t help tap your feet to the 1930’s jazz-style covers of Disney songs that they sing during dinner. While they sing, Tiana and Louis come around to each table and do individual meet-and-greets! Then there is an amazing New Orleans-style dessert menu, including a bananas foster Sundae with a white chocolate Tiana’s Place logo, and beignets of course! While eating, the amazingly wonderful wait staff pass around Mardis Gras beads, since at the end of each Tiana’s Place dinner there’s a Mardis Gras celebration. When the celebration is about to begin, Tiana and Louis go up on stage with the Crawfish Crooners, to get everyone up and dancing! The waiters and assistant waiters pass around paper musical instruments to the kids, umbrellas, and other fun Mardis Gras props and get the kids to dance around the restaurant with Louis while Tiana sings “Dig a Little Deeper”. My daughter had the absolute best time, and the whole dinner felt like an incredible and perfectly times performance. 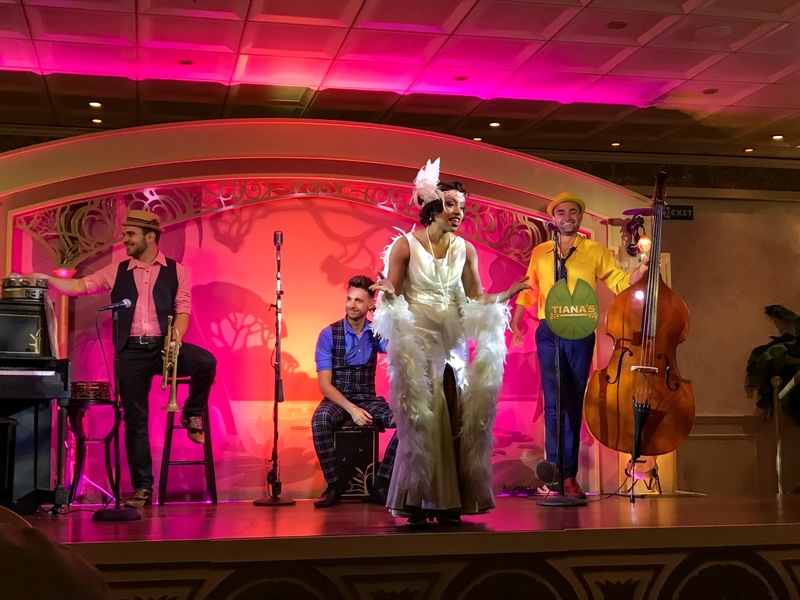 When we ate at Tiana’s Place on Disney Wonder, it was our last meal of our trip, and was the most amazing way to end our vacation! Tiana’s Place alone is incentive for me to want to plan another Disney Cruise trip on Disney Wonder!